After the recent political turbulence in Italy and the remarkable developments regarding US and North Korean relations, market focus returned to central bank policy this week, with important meetings being held in the US, Europe and Japan. During the crisis central banks in the advanced economies acted in a similar way – now as they exit from cheap money, both the timing and the approach looks set to differ and this divergence could have market consequences. The approaches can differ both in scale (with the Fed acting sooner and more aggressively than others) and in sequencing: the Fed’s focus is on hiking rates, whilst the ECB’s immediate focus is on halting QE before rate hikes begin. Also, the effectiveness of the guidance given by central banks has varied, impacting the markets too. As was widely expected, the Federal Open Market Committee voted to increase the Federal Funds rate by 0.25% to a target range of 1.75-2%, citing the continued, significant improvement in the economy and labour market, with inflation approaching the target level as sufficient evidence to continue gradually normalising interest rates. Chairman Powell did stress however that after many years of inflation running below target, the Fed were not yet declaring victory and that it was imperative to ensure price increases remain close to the symmetric 2% goal for the near future, i.e. they would tolerate inflation temporarily above target on the proviso it was expected to return. The Fed’s forecast for inflation was marginally increased for 2018 and correspondingly the median forecasts for the Fed Fund’s rate were slightly increased to levels higher than their long run expectation for 2019 and 2020, although the majority of members did not change their forecasts. In other words, before long, the policy setting will be at a neutral level, where the economy is no longer being stimulated. So, whilst the policy action delivered little surprise, we think the key things to monitor going forward are the impact of the large scale fiscal stimulus on growth and inflation and whether this may cause the Fed to alter their path of monetary tightening, either through interest rate adjustments or altering the pace at which they decrease the size of their balance sheet. Indeed, we feel that the US is moving towards late cycle and inflation pressures are building. 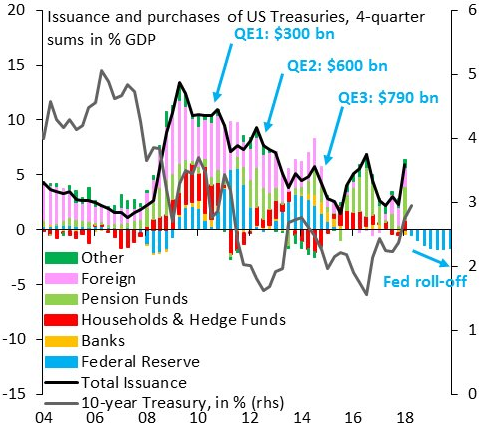 What then for the impact on US treasuries? The communicated plan to reduce the Fed’s balance sheet is to decrease the reinvestment of principal by an extra $10bn each quarter through 2018 from $20bn to $50bn and then continue at this pace, however debate remains about how long this policy shall continue, or put another way, what is the target size of their balance sheet. Note the current size of the assets on the balance sheet is approximately $4.5tn dollars. At the same time, as a result of the fiscal stimulus, the Federal deficit is expected to be $804bn in 2018 and $981bn in 2019, resulting in approximate net issuance if $1.17tn in each year. All of this is at a time when foreign demand for Treasuries is waning, particularly from the largest holders Japan and China. Hence, what remains to be seen is whether the necessary demand to offset the large increase in supply is met by international investors, through outflows from other asset classes, or to what extent yields will rise. Governor Draghi once again demonstrated a masterclass in communication of monetary policy at this week’s ECB meeting in Riga. Despite announcing the plan to taper the Asset Purchase Programme in September and to fully wind it down by December, European equities and bonds rallied. His rhetoric was sufficiently cautious to calm investors who were concerned that the ECB could prematurely tighten policy, like they did in 2011, especially as indicators of core inflation remain well below target and economic data has been much softer in 2018, albeit falling from very elevated levels in the second half of 2017. The key aspect of the statement was that rates will remain unchanged at least through the Summer of 2019, towards the end of Draghi’s tenure, and the extent which he stressed ‘significant monetary stimulus’ was still needed to bring inflation sustainably towards the 2% target. It seems that monetary policy divergence between the US and Europe, which can be seen through the difference between 2 year bond yields for the US and Germany, is to continue for a while yet. In the face of policy tightening across the globe, the Bank of Japan kept monetary policy on hold at their meeting on 15th June, maintaining interest rates at -0.1%, the 10-year bond yield pegged to 0% and committing to asset purchases of ¥80tn a year. There remains an absence of price pressures in the region, which Governor Kuroda explained recently has been a result of falling durable goods prices, caused by the stronger currency and temporary weakness in accommodation prices, but also noted that Japan has a challenge in combating the deflationary mindset of households and companies, which have become entrenched due to 15 years of deflation. Furthermore, future inflation forecasts were downgraded which we believe signals that moves towards tightening in the region will begin a long time in the future, and with an additional consumption tax hike planned for 2019, it may even be that further easing is required to stimulate demand. The Bank of England meet on 21st June – we will discuss any noteworthy developments afterwards.